Super healthy real food pancakes, kissed with a touch of shredded beet to create gorgeous festive pink pancakes! 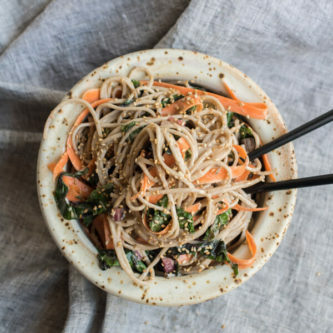 Paleo, gluten-free, dairy-free, and so yummy! 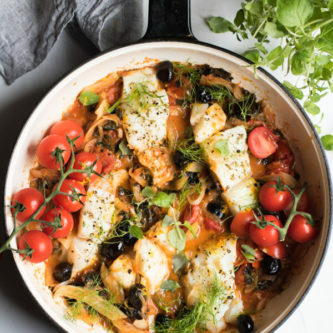 I have random recipe ideas that usually hit me first thing in the morning. Last week I kept thinking about a street corn salad with Cuban sandwiches croutons. Seriously random. This week it was pink pancakes. It was all I could think about. So you guys, do you know what I did? I made some damn good pink pancakes! I tried no less than 7 different versions until I reached pink perfection. 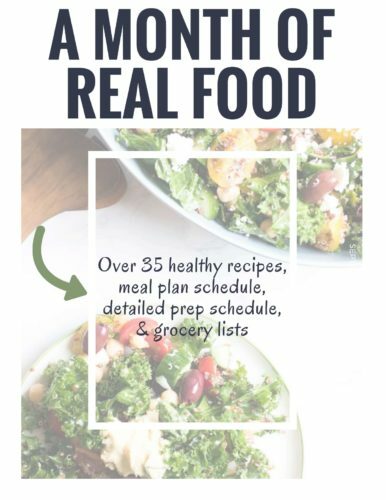 This is a straightforward, simple recipe, that uses only whole food, real ingredients. No creepy pink food coloring here. NEVER! I tried this recipe using the 2 ingredient pancake method (1 banana + 2 eggs) but couldn’t get over the texture, wet sponge. I’m sure the 2 ingredient pancake is great for toddlers but this adult woman does not enjoy chewing on a wet sponge. I settled on Bob’s Red Mill Paleo flour as the base. 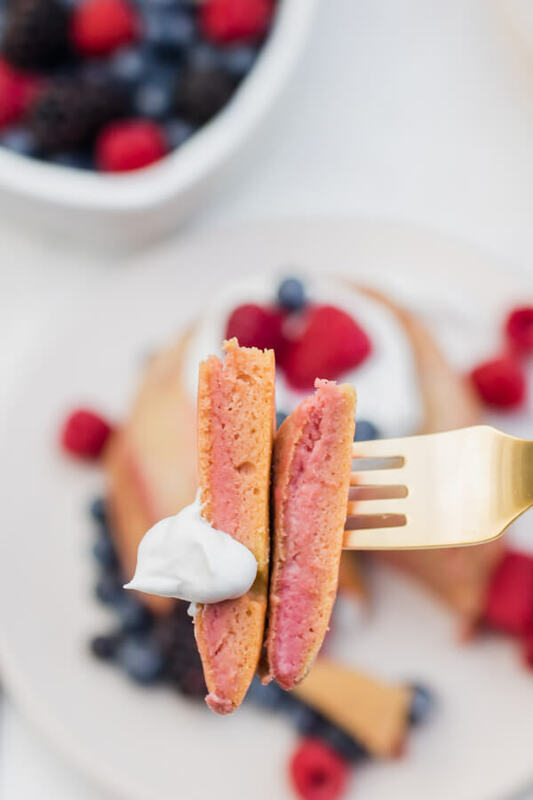 I love the simple ingredients (almond flour, coconut flour, and arrowroot powder), and the texture of the final product was straight up fluffy pancakes perfection. With one special addition. Collagen Powder. Collagen is the most abundant protein in our bodies, found in muscle, bone, skin, blood vessels, tendons, and our digestive system. 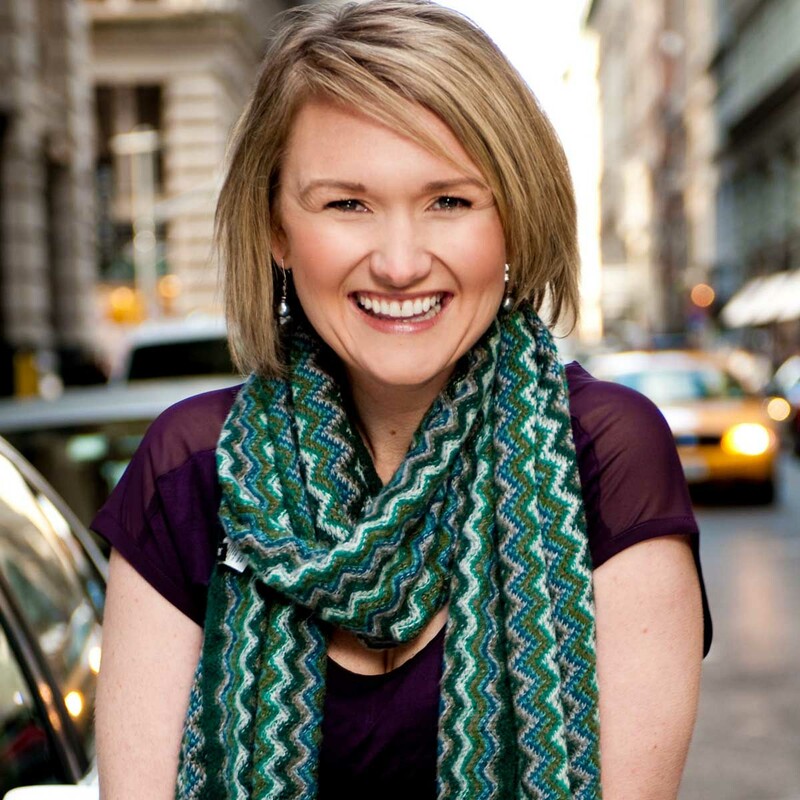 Collagen provides our skin with strength and elasticity. Collagen is crucial to the body’s muscular structure. 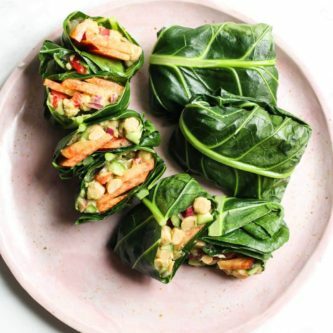 Lifestyle factors (like smoking, a diet high in refined processed foods, and extreme exposure to the sun) contribute to collagen levels depleting in our bodies, as does aging. Good news: collagen protein sources (also abundantly found in bone broth and these healthy gut gummies) are now readily available and certainly a wellness trend worth trying. 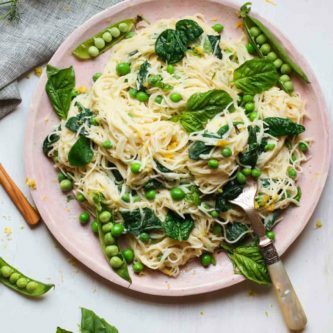 Collagen contains 18 amino acids, including indispensable (previously referred to as essential) amino acids meaning they must be acquired by the diet. 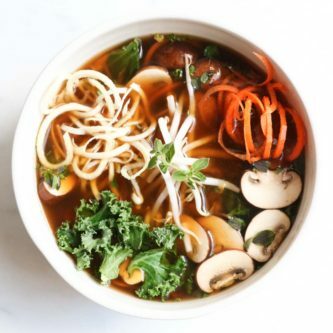 Collagen has been touted as a supportive food for healing the gut lining as it can enhance gastric acid secretion and aid in restoring a healthy mucosal lining. A recent study has shown that ingestion of gelatin can reduce cellulite and improve wrinkles. Um yeah, you should try this stuff. 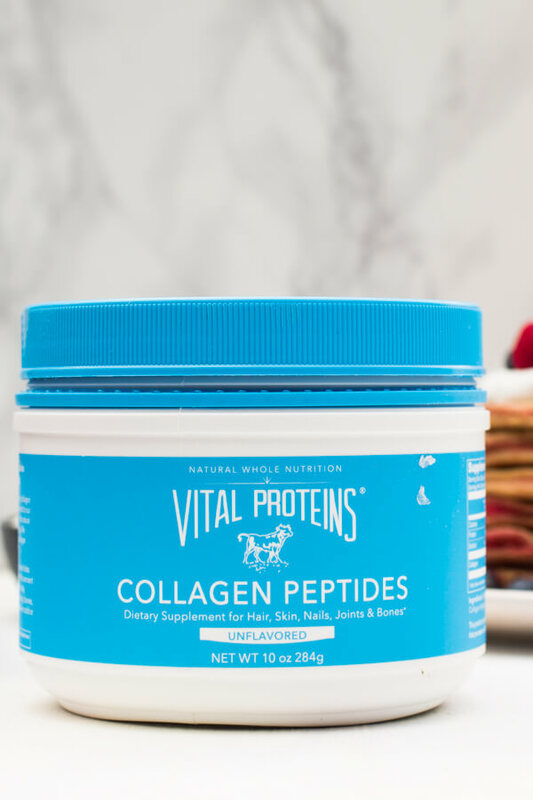 Vital Proteins Collagen Peptides is flavorless but loaded with protein at 20g per scoop! It also helps make these pancakes super fluffy. The perfect breakfast treat for Valentine’s Day, Mother’s Day, or just a Sunday pancake party. I served them with whipped coconut cream, because it’s delicious, and a ton of fresh berries. 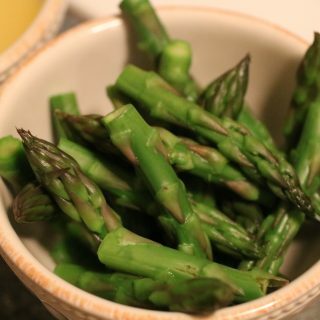 You can certainly go traditional, butter and maple syrup, or almond butter and strawberry jam would be amazing! 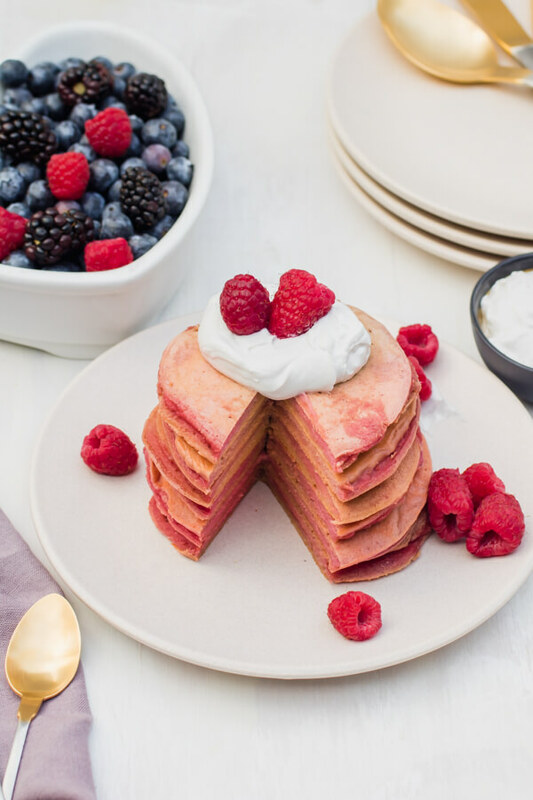 Whatever you decide to top these pink pancakes with I promise they will be amazing. 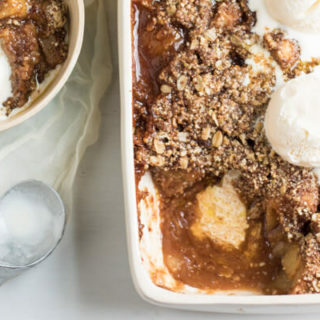 Just throw all of the ingredients into your blender and get your pancake making station ready. One note, as you cook your pancakes you will lose some of the pink color. Since I tested so many batches I can tell you that if you overcook them the tops will no longer be pink, but the center should retain that pink hue. You can always add a bit more beet to the batter to ensure higher pigmentation, but really the pink is just for fun. 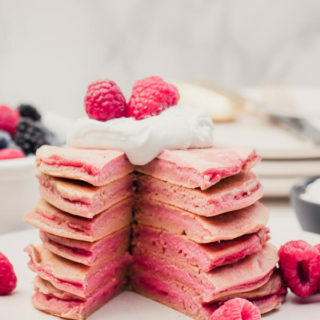 Get ready to take a bite of these perfectly pink protein pancakes. 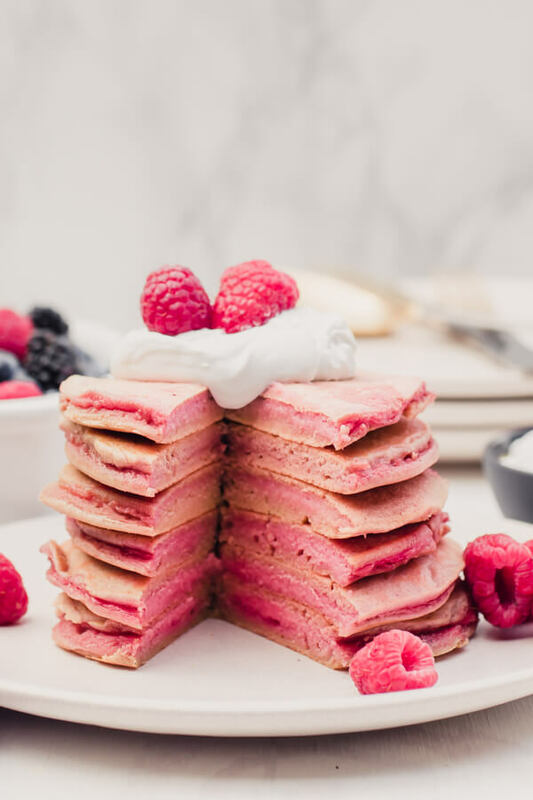 Perfectly pink paleo protein pancakes, how many P words can I add to a sentence? 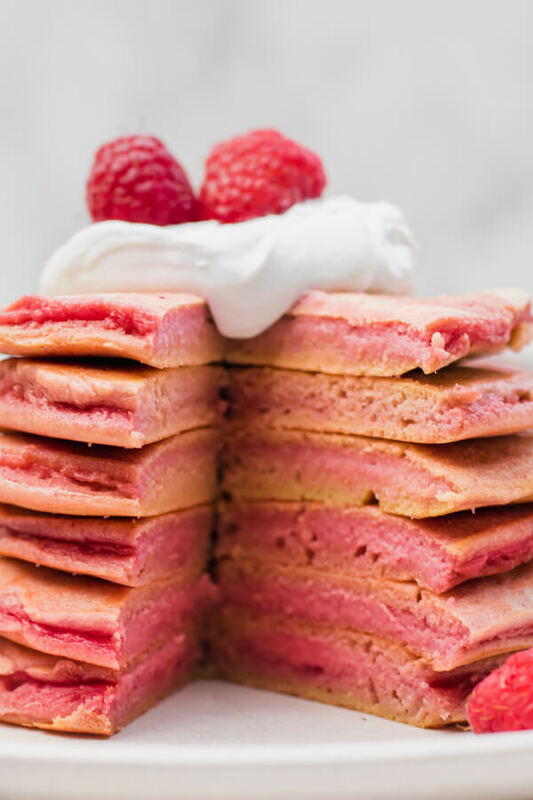 Perfectly pink paleo protein pancakes that are officially approved by my pup, Penelope Pancake (actually legal name of my dog). 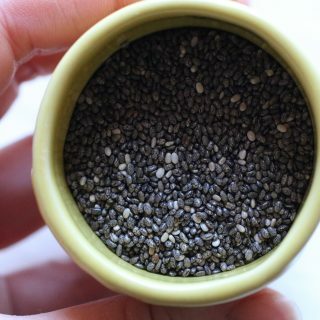 Combine all ingredients (except coconut oil) in a blender. 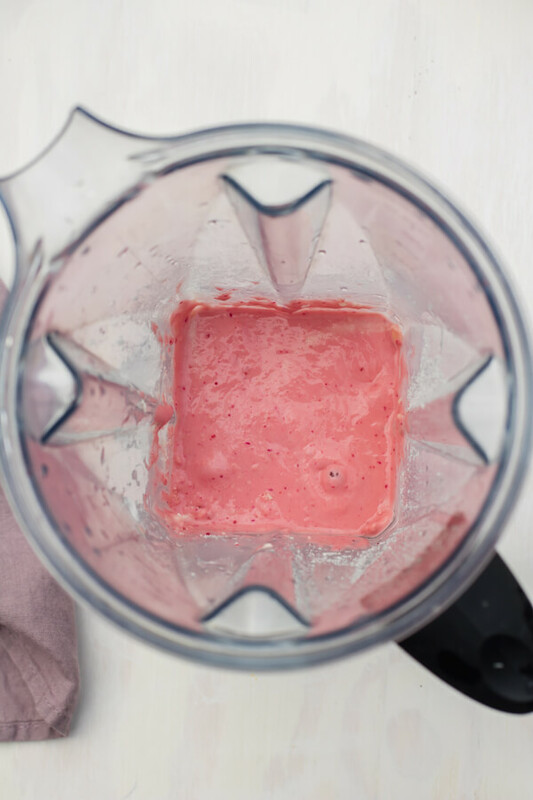 Blend until well combined and smooth (about 45 seconds to 1 minute). Heat a large skillet over medium heat. Melt coconut oil, using about 1/2 tsp at a time. Pour batter into hot pan, 1/4 cup at a time, and cook on one side until bubbles begin to form. Flip and cook for several more minutes on the other side. Continue until all batter is used. Pancakes will lose some of their pretty pink color as they cook. Top with coconut whipped cream (see notes for recipe) and fresh berries. If you double the recipe, don't double the collagen peptides. 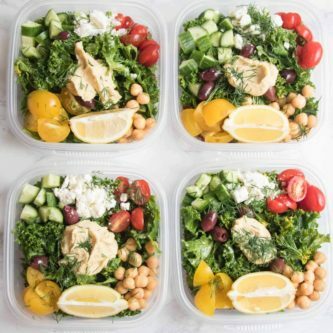 For each "doubling" add an additional 1/2 scoop of collagen peptides. 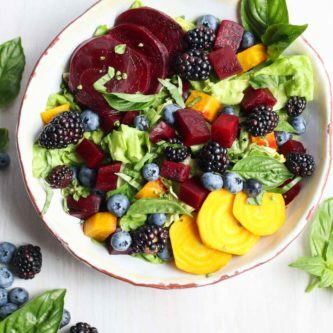 You can certainly try this recipe with your favorite pancake base, just add a bit of shredded beets and some collagen peptides.